Annual celebrations of Navratra Festival - 2009 inaugurated. Katra, September 19 - The 9-day annual event of Navratra Festival-2009 was formally inaugurated today amidst a colourful ceremony at Katra, the base camp of the Shri Mata Vaishno Devi. 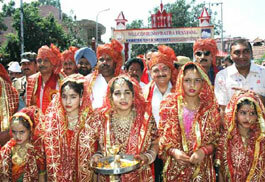 A view of colourful ceremony during the inauguration of Annual Navrata Festival-2009 at Katra, Jammu. Navrata Festival-2009 took to a colorful start with Minister for Revenue, Relief and Rehabilitation, Mr. Raman Bhalla inaugurating the mega event at Katra by lighting the traditional lamp at Asia Crossing on Saturday. The Navratra festival, 14th in the series, is being organized by Shri Mata Vaishno Devi Shrine Board (SMVDSB) and Tourism Department in collaboration with the local organizations. As a part of the inaugural ceremony, the magnificent Shobha Yatra was taken out at Katra depicting the rich cultural heritage of the State amidst spiritual ambience from the Asia Crossing which culminated at bus stand. The procession comprised a large number of pilgrims from across the country and abroad, school children, cultural troupes and tableau. The helicopters showered flower petals on the procession adding colour to the occasion. Extending greetings to the people in general and pilgrims in particular, Mr. Bhalla said that the festival provides an opportunity to the visiting yatris from various corners of the country and abroad to have a glimpse of our rich cultural heritage and peaceful co-existence of people of different faiths who live here like brothers and treat the guests above all. He said that Katra has its great importance not only as a base camp of the holy cave shrine but also one feels the spiritual bliss as soon as one reaches Katra. All out efforts are being made by the present coalition government to create the additional infrastructural facilities at the holy town Katra to meet out the increasing rush of pilgrims effectively, he added. Lauding the role of various local associations associated with the Navrtra Festival, Mr. Bhalla said that such a mega event could not be successful without the active participation of the locals. Appreciating the people of Katra for their untiring efforts in creating facilities for the pilgrims, the Minister said that the town has achieved manifold development over the years with the blessing of the Goddess .He said that pilgrims are our honored guests and we should do as much as we can to facilitate them. Responding to the developmental demands of the town put forth by the local MLA and other senior citizens, the Minister said that all the issues and developmental requirements like augmentation of drinking water and health care facilities would be considered on priority. MLA Reasi, Mr. Baldev Raj Sharma while speaking on the occasion said that since the inception of Shri Mata Vaishnodevi Shrine Board, Katra town and Vaishno Bhawan and enroute Katra to Bhawan witnessed a sea change in creation of infrastructural facilities by the Shrine Board for the pilgrims. He also put forth developmental demands like augmentation of drinking water and power supply, early construction of hospital building at Katra. The Divisional Commissioner, Jammu, Dr. Pawan Kotwal who is also the Chairman of the Navratra Festival Committee, Katra hoped that the festival would help in attracting more and more pilgrims to the shrine and their number would cross the last year’s record mark and expected to reach 80 lacs this year, adding that so far 60 lac devotees have paid obeisance at the holy cave shrine during the current calendar year which is 12 lacs more as compared to the corresponding period of last year. The festival would also help in diverting a large number of pilgrims to other important pilgrim and tourist destinations in the area, he said. Dr. Kotwal while appreciating one and all for their participation in the Shobha Yatra and other events associated with the festival, hoped that the festival would gain new heights in the days to come. President Municipal Committee , Katra, Mr. Ambrish Magotra welcomed the participants to the inaugural function and urged for making the festival more vibrant in the years to come so that record number of pilgrims are attracted. Deputy Commissioner , Reasi, Mr. P.K.Pole, Director Tourism, Jammu, Mr. S.M Sahni, Director, Local Bodies, Jammu, Joint Director, Information, Jammu, Addl. SP Katra, Dy. CEO SMVDSB Katra, SDM Katra, senior officers of district administration, President, All India Devotional Song Committee, Katra, Mr. Rakesh Wazir , President, Hotel and Restaurant Association, Katra, Mr. Sham Lal Kesar, President, J&K, Indian Style Wrestling Association, Mr. Shiv Kumar Sharma, President, Cultural Association, Katra, Mr. Surinder Khajuria, President Bhagwat Katha Committee, Mr. Sardari Lal Dubey and members of the festival committee were prominent among those present on the occasion. As part of the festival, cultural procession will be taken out from Asia Chowk at 7 p.m., All India Devotional Song Competition will be held at Shri Yog Ashram Air Strip, Katra at 8 p.m. and cultural programme will be arranged by the Song and Drama Division at GHSS, Katra at 8 p.m. daily. Similarly religious discourses on the Ramayana and Bhagwat Gita will be held at Raghunath Mandir from 3 p.m. to 6 p.m. and wrestling competition in which nine wrestlers from Pakistan are scheduled to participate will be held at Vivekanand Sports Stadium, Katra on September 22 from 12 noon to 6 p.m.
Exhibition of Departmental stalls would be held at GHSS, Katra from 2 p .m to 10 p.m during the Navratra Festival. 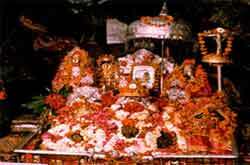 The Navratra Festival is a collaborative effort of Shri Mata Vaishno Devi Shrine Board and Tourism Department supported by some of the local organizations.